I've had some harsh words for lesser Steampunk mods, and with good reason—it's getting tired, and most examples are massively boring. 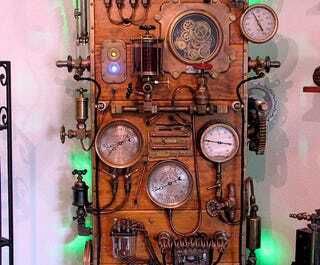 Not boring: the "Frankenstein Steampunk", an absurdly thorough PC mod built by Dana Mattocks. The first thing you notice about this mod is its size—it's 8 feet tall, and weighs over 400 pounds. The project apparently took a year to complete, and it shows. Not opportunity for modification is pass up, with everything from the power button (a discreet brass valve) to the air intake (an old church floor vent) gets a neo-Victorian overhaul.